Sean Wilson, who as Head of Schools presided over the International School of Louisiana’s long climb into the city’s top tier of open-enrollment charter schools, has been offered the job of leading the International High School next year, leaders there say. While the two charter schools share a number of goals (as well as the similar name), they are completely separate entities. The previous head of IHS, Anthony Amato, was serving his final year there when he unexpectedly died earlier this year, and Nan Ryan was named interim head while the school board continued its search for Amato’s successor. The IHS board hired a consulting firm that conducted a national search that led to progressively smaller pools of applicants, until the final seven met with IHS board members via Skype and were narrowed down to three — an educator in Pennsylvania, an assistant head at a Chinese-American school in San Francisco, and Wilson. 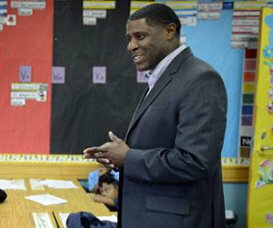 The three candidates toured the school last week, and the school subsequently announced that Wilson has received the board’s nomination. “He has been offered the job, and we anticipate he’ll be coming on,” said board chair Rob Couhig III in a phone interview Monday morning. “We don’t ever want to be a place that says let’s take this kid and not that kid, based on ‘x,'” Couhig said. The high demand for seats at ISL and the “off the charts” approval ratings from parents also recommended Wilson, Couhig said. Wilson could not be reached for comment Monday morning.